We'll also be performing for free this Friday from 6:30 - 8pm, surrounded by and taking inspiration from books in the basement of Labyrinth Bookstore. The trio is composed of Jerry D'Anna on bass, Ron Connor on piano, and myself on saxophone, clarinet and woodpile. Note: To supplement your musical diet, you can hear selections from our repertoire at www.myspace.com/sustainablejazz. Upcoming performances are usually listed here. It seemed a straightforward drive out into the country, to help a currently carless friend check out a cottage to rent at a small farm. 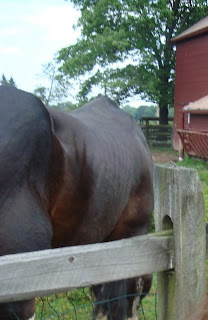 The farm came with 40 sheep, which help mow the neighbors' lawns, and a retired draft horse named Gentle Ben. I found the big horse with the ornate Clydesdale-like hoofs impressive, though if this picture looks curiously composed, it's because I cropped off my daughter holding her nose. Kids tend to exaggerate. Away from the animals was a fire circle, the likes of which people have told me they wished could be had in Princeton for gatherings of youth groups like the Girl Scouts. On the way back, the trip took on new dimensions when we stopped out of curiosity at an old country railway station, which came equiped with its very own steam engine, built by the American Locomotive Company back in 1937. Nearby were an assortment of old train cars and retired cabooses. Some had "stay off" signs, others did not, and the general feel of the place suggested an unstaffed, informal railroad museum. Seeing no signs disallowing it, we decided to explore the steam engine's cab, packed with levers of many shapes and obscure functions. Lower in the photo you can see a cupholder (a design feature that anticipated the mounting of cup holders on strollers many decades later). Careful examination of all the surrounding levers suggested that this is where the engineer would make his cappuccino during long cross-country trips. and the simple utility of a windshield wiper on a caboose. Even the weeds were authentic, reminiscent of what I used to see along rail lines in the midwest: Wooly Mullein, Queen Anne's Lace, bull thistle, sweet clover and, less endearing, given past run-ins with its invasive capacities, spotted knapweed. until we passed by a gas station on Hopewell's main drag, where some horseless carriages had paused on their journey to Princeton. The proud owner of a 1905 Oldsmobile even offered to give each of us a ride. One cylinder, two gears, a rudder instead of a steering wheel, and a smooth quiet ride. "The first mass-produced horseless carriage," he said. The Model T was still a few years off. I thought it would get great gas mileage, but he guessed around 18 mpg. The carburetor leaks more gas than it passes along to the engine, he said. Like my daughter, he emphasized the unflattering aspects of horses, referring to the 10,000 pounds of manure produced in New York City each day before horseless carriages came along. Future histories, written in a world transformed by climate change, will look more kindly on Gentle Ben than on the machines that followed, but it was a charming bit of serendipity to happen upon so much free-range history out and about on a Sunday afternoon. Weeding--An Expression of Love or Intolerance? The New York Times has published a couple curious opinion pieces recently about introduced species. The general conclusion offered is that we should learn to live with all the introduced weeds rather than try to counter those that prove destructive and invasive. One opinion piece, entitled "Mother Nature's Melting Pot", actually suggests that people who fight against any non-native species are nativistic and xenophobic. It's strange to see such naive and fatalistic thinking finding space in the newspaper of record. Weeding my garden the other evening, I found the act to be informed not by xenophobia but by love. When I was done, hundreds of nut sedge (non-native) and silver maple seedlings (native) were lying in a heap. Spared were a dozen far less aggressive species that would have otherwise been lost in a weedy tide. I have nothing against nut sedge, which has a beautiful inflorescence, or silver maples, which when not producing a million seeds are providing shade and air conditioning. It's just that I like other plant species, too, and experience shows that the nut sedge and maple seedlings in my backyard have imperialistic tendencies. On a much larger scale, the Friends of Rogers Refuge have been fighting a several acres' infestation of Phragmitis (non-native) which would if left undeterred eventually turn a richly diverse wetland into a monoculture of greatly reduced habitat value. The paradox is there for anyone to see. People who love plants spend a lot of time killing some of them in defense of the plants and diversity they love. A ready analogy is the act of editing, in which the love of writing leads to an unsentimental excision of weedy words. The new conceit, expressed in the above-mentioned opinion piece and a subsequent one entitled "The Price of Liberty: Weeds", seems to be that we should abandon largely futile resistance and open our minds to an agreeable acquiescence. Since some weeds introduced from other continents are relatively benign, or even have positive attributes, it is then argued that we should accept any and all introduced species wherever they want to grow. The result of this laissez-faire approach, promoted as a liberation from intolerance, is actually the promotion of "intolerant" plants--the subset of weeds whose aggressive behavior diminishes biodiversity over time. Though dressed up in a newspaper as synonymous with tolerance, this "let it be" approach plays out in the field as just another form of neglect. Another sight to be seen from Hamilton Avenue is the raingarden at Spruce Circle, just up from the intersection of Hamilton and Harrison Street. Type "raingarden" into the search box at the upper left of this blog and you'll find posts showing the raingarden in various seasons. In July, the switchgrass (foreground) is fully grown, and the JoePyeWeed is in full flower (tall and purple). A view uphill from the raingarden shows the long roof that feeds the garden during rains. Here's a view from uphill looking down. Rain flows through the downspouts and out onto the grass, then down to the raingarden, where it collects and infiltrates into the ground over the next 24 hours or so, creating a nice underground reservoir of moisture to feed the roots of the wildflowers through droughts. Only in the most extreme droughts, such as the two-month long drought last year, does watering prove necessary. Scattered through town, taking advantage of wet, sunny spots, raingardens like this one serve as lifelines for pollinators otherwise starved by the trees n' turf landscaping dictated by convention. New Sprout Next To Princeton's "Mother Elm"
Keep riding up Hamilton Ave. and it starts changing names, which is one of the exciting things about living in Princeton. You think you're on one lazy street, when suddenly, unbeknownst to you, it has changed itself into another. Hamilton Ave. is one of the most dynamic stretches of asphalt in this respect, perhaps in all the world, because it begins as Tyson Lane down in the lowlands of the east, then transforms itself in the blink of an eye into Littlebrook Road. Before you know it, it's changed again into Rollingmead Street, then settles into Hamilton Avenue for a good six blocks before whimsically becoming Wiggins Street. Subtle clues, which I have yet to discern, tell you if you're on a lane or a road or a street or an avenue. Just before Wiggins is about to give up the ghost to become Paul Robeson Place, across from the public library, a glance into the cemetery will reveal a new American Elm growing next to the stump-shaped gravestone of the great "mother elm". Unlike many distinguished denizens of Princeton, the "mother elm" did not win a Nobel Prize, but it did earn an article in the NY Times at the time of its passing in 2005, telling of its glorious past and contributions to society. Those are some big shoes for the new tree to fill, but it appears unfazed. My daughter says that what she likes about bike riding is that you're going just the right speed to see everything as you go by. A bike ride up Hamilton Ave. offered some fine displays of weeds for general edification. Most people would see in this photo a royal spread of turf meant to set off Westminster Conservatory to its best advantage. But what I noticed is the expanse of Nut Sedge spreading through the lower parts of the lawn. It's the light green in the photo, contrasting with the darker green of the turfgrass. You likely have Nut Sedge growing in your garden. Like all sedges, it has a triangular stem. Most sedges are native and perennial. This one is non-native and an annual. It pulls out of the ground very easily, but is intimidating in its abundance. Either keep it well pulled, or suppress it with mulch, or, if you don't mind it taking over your garden, enjoy the attractive inflorescence it constructs on top of the stem. As to what can be done about such an invasion of traditional turf, it's doing a good job of defining where Westminster could plant an expansive raingarden to feed the local pollinators and birds. Further up Hamilton Ave., a fine display of Bindweed, the weedy member of the morning glory family, here seen crawling over boxwoods and a fence. Like Nut Sedge, it can be very hard to get rid of, but staying on top of the weeding will slowly starve the underground portion. During heavy downpours like yesterday's, water from my neighbor's driveway used to head straight for my house. This flow of water from one property into another is a common source of tension between neighbors. Rather than complain, I dumped some extra dirt under some bushes on that side of my yard, forming a berm that redirects the neighbor's water towards the front of my lot. The water flows into a raingarden under the dogwood tree, where a buried, perforated pipe carries any unabsorbed water out to the sidewalk. It's subtle, but you may be able to see the water flowing across the sidewalk into the row of hostas. The goals here are 1) divert water away from my foundation, to reduce humidity in the basement, 2) capture some runoff in a raingarden so it has time to infiltrate into the ground to feed the trees, 3) use the city stormwater system in the street as an escape valve for any extra water the raingarden can't hold. The only drawback is that, if you want to have the satisfaction of seeing that the system works, you have to go out in the rain, which, after the lightning and thunder has passed over, may not feel like a drawback at all. Why browned oak leaves in early summer? Maybe this newly planted tree, with only a few green leaves left at the tips of branches, simply didn't get enough water, but another factor is its size. The bigger the tree being transplanted, the bigger the shock, not to mention the sticker shock. Hopefully it will recover and leaf out fully next spring. but it's the only way to keep some of the university's remaining American elms alive (probably through injection into the trunk). This one isn't as graceful as some elms, but shows the distinctive vase-like shape that made elms such a wonderful street tree before Dutch Elm disease arrived on the continent.